What a bittersweet end to the Izod IndyCar Series for Alex Tagliani and the Barracuda Racing team. Tagliani led 19 laps and was out front with 23 laps to go in the season finale MAVTV 500 at Auto Club Speedway in Fontana on Saturday night. But what the team described as mechanical problems ended Tagliani’s night prematurely. He withdrew from the race with 21 laps to go and finished 20th. 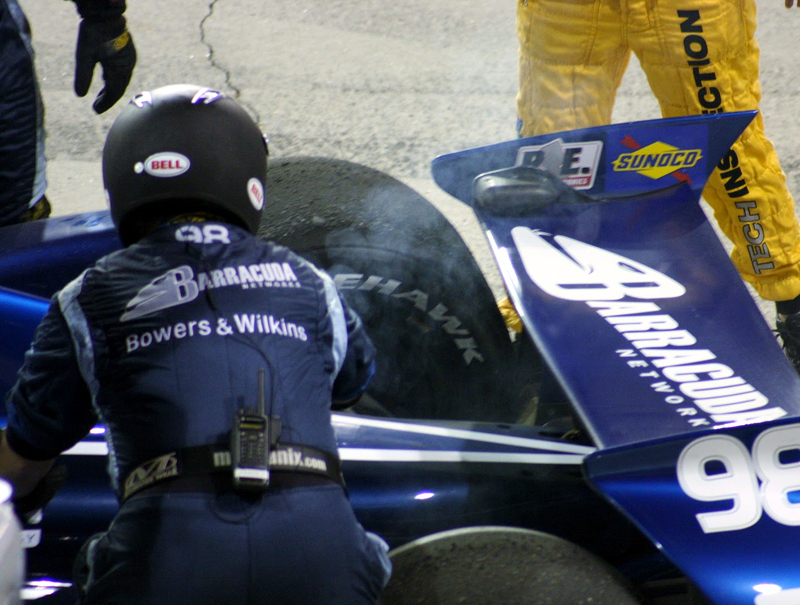 Tagliani, driving for the team owned by Valencia’s Bryan Herta, pulled into the pits and relinquished the lead with smoke seeping from the car’s engine. It looked like the engine burned up. Alex Tagliani was leading the Izod IndyCar Series season finale at Auto Club Speedway when his engine blew with 21 laps remaining in the race. Photo: Tim Haddock. Ed Carpenter won the race taking the lead from Dario Franchitti on the last lap. Ryan Hunter-Reay won the IndyCar Series championship by the slimmest of margins. He finished fourth in the race and edged out Will Power by three points to win the series title. Power entered the IndyCar Series season finale with the lead in the standings. But he spun out and crashed early in the race. His team repaired his car and he returned to the race briefly. Power ended up with a 24th-place finish and completed on 66 laps.